✨"Problems are only opportunities with thorns on them." Hugh Miller. 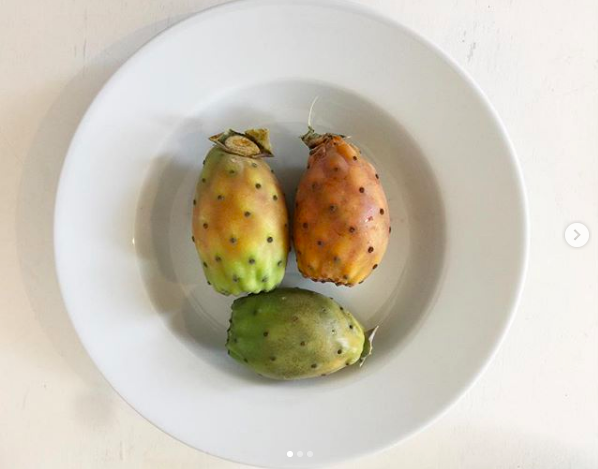 We are creative beings able to find solutions, I focus on finding ways through the wall of spikes✨Prickly Pears / Ficus-Indica originate from the Americas and slowly made their way into other areas of the world. There at least 18 species of this beautiful fruit. Both the fruit and the pads are edible and have considerable healing properties. Sweet and fleshy with numerous seeds. Flavour is delicate and varies in intensity, watermelon, strawberry, banana with hints of citrus and honey. I was obsessed with these are a child and kind of still am 😁. Be sure to try them if you're ever in Sicily. Rich in polyphenols, flavonoids and betalains - all antioxidant compounds which help neutralise free radicals. Vitamin C - immune boost. Dietary fibre - helps digestion. Plus an array of other vitamins, minerals and phytonutrients to promote a healthy body. ✨"Thoughts come and go. Feelings come and go. Find out what it is that remains." 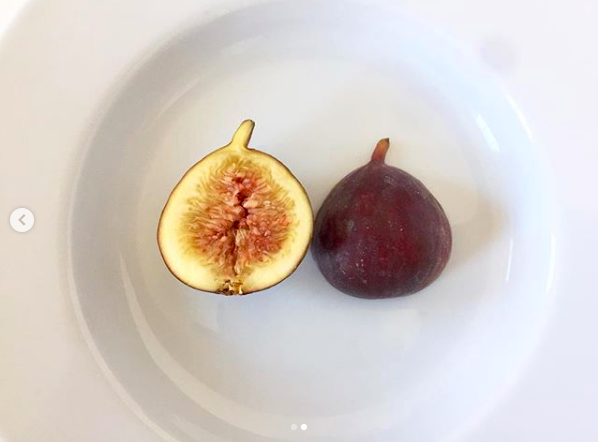 Ramana Maharshi.✨Let's try and connect to our true nature and express our infinite potential to serve our community instead of acting from the limited perspective of personhood.🍂 Autumn Honey Fig: A similar variety to the well known Brown Turkey, these lesser known figs have a much thinner skin and are somewhat sweeter. Figs are a powerhouse.. They are said to be one of the oldest fruits dating back to biblical times and were one of the first cultivated fruits. The fig is actually an infructescence, (inverted flower)🌷. A fig trees roots grow super deep, the deepest recorded roots have reached depths of 400 feet, so don't worry about top soil degradation when it comes to certain fruits. High in fibre, magnesium, manganese, sodium, B6, K, A, B1, B2, iron, phosphorus, potassium and calcium. Promoting bone density and helping lower blood pressure. 🍂Fruits have the power to assist the body back to homeostasis, a state where it can heal and regenerate. May we all find our truth 🙏. ✨"The more you look, the less you find." O.C.✨Searching for the truth is a double edged sword, cos there's nothing to find and you are already that, it is your essential nature....to know truth is to know god. 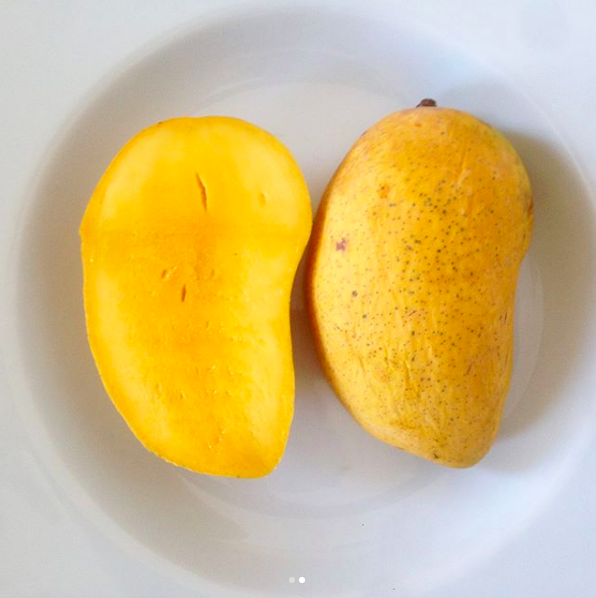 💛Honey mango - A general name given to a number of Pakistani mangoes...however this Chaunsa variety has to be one of my favourites. It's super sweet, fibre-less and juicy with a floral yet deep woody flavour. First grown in India more than 5,000 years ago. The tree plays a sacred role in India; it's a symbol of love 💛. Prevent Cancer (high in antioxidants). Lowers cholesterol (high in fibre, pectin and vitamin C). Improves eye health (high in vitamin A). Helps alkalise the body (tartaric, malic and citric acid help maintain alkali reserve). ✨"The smallest spark of light from within, ignites and floods the being with divine love soon to realise it is that love and was always shining brightly, only somewhat skewed by the ego and it's forever dark facets...oh how we suffer while lost in the dream! !✨🍒Cherry: Believed to originate from Asia Minor near the Black Sea. Known to have a very short fruiting season grab some while you can! Contain Melatonin and high levels of antioxidants. Helps with arthritis and inflammation. Helps lower blood sugar levels. ✨"You are capable of amazing things"✨We are part of nature, therefore we are nature itself, made from the same energy that creates worlds, and endless universes, to remember that power is to be in alignment with it 🙏. 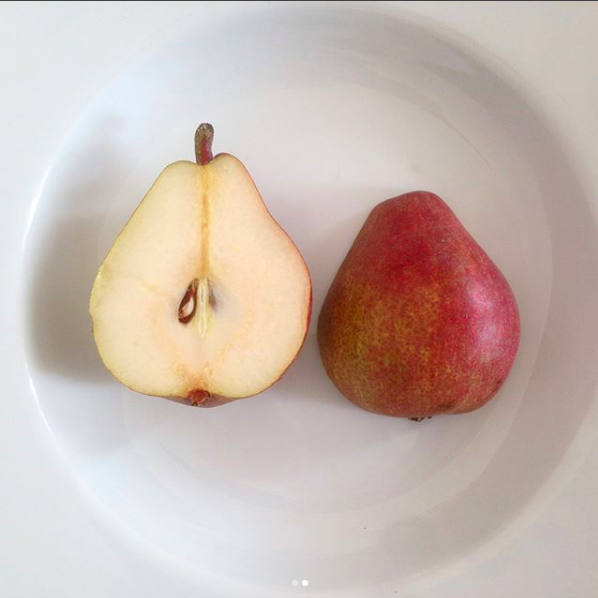 🍐Blush pears: Originally from temperate China. It is the fifth most widely produced fruit in the world. Over 3000 known varieties are grown worldwide. In Greek mythology pears are sacred to three goddesses; Hera, Aphrodite, Pomona. The Chinese believed the pear was a symbol of immortality as the tree can live for many years. And on and on and on...for days!! ✨"If you do what you've always done, you'll get what you've always gotten" Tony Robbins✨ I think we know this deep down but often the fear of failure stops us from attempting to try something new, even if we know it will help or it will challenge us to grow. Commit to one new positive thought or action today 🙏! Lychee/ "Chinese Strawberry": Unknown variety from Vietnam; OMG these grape/pear-like bombs are so much bigger, sweeter and juicier than the usual Mauritius variety. The northern province of Bac Giang are entering the main crop season where they are expected to harvest 150,000/180,000 tons...wow!!! The quality and shape are considered as the best in the last 10 years 👍. This unique fruit originates from tropical China, where cultivation is documented from 1059 AD. Plus a long list of amazing benefits. May we all grow and know our worth so we can stand tall and give back to this beautiful earth 🌏❤️. ✨"It is much easier to show compassion to animals. They are never wicked." Haile Selassie✨We often disapprove of violence towards our fellow "pets" - so why can't we extend that compassion towards pigs, cows, sheep and chickens, and fish and why not all living beings...?🙏 Honey mango: Originally Pakistan. The mango season is upon us...excited 😁. There are over 2000 varieties of mango on this planet all of which have slightly different flavours and textures 👍!! The mango tree plays a sacred roll in India; it's a symbol of love and is belived to grant wishes 💛. High in vitamin C, Fibre, Vitamin A and calcium. ✨"You are right here, nowhere to travel to find yourself, nothing to become to be who you already are, nothing to read to know your truth, you are that, we are simply and effortlessly that awareness"✨Oh if only life was that simple....oh wait...maybe it is...we make it complicated 🙏. 🌱Alphonso nicknamed the "King of Fruits" (in India) due to its rich, sweet flavour and creamy fibre less pulp. 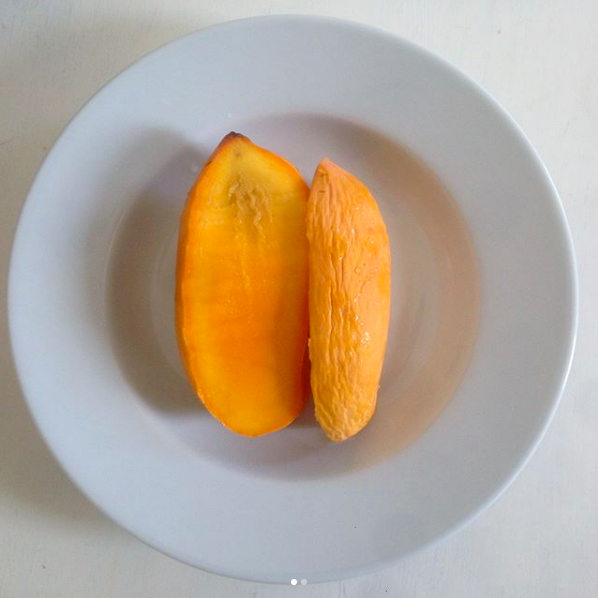 Scientific fossil evidence indicates that the mango made its first appearance around 25/30 million years ago in Northeast India, Myanmar and Bangladesh. In the history of Buddhism the mango came to represent faith and prosperity, ancient Indian kings and writer-travellers would plant mango trees along roadsides and highways as a symbol of prosperity. There are over 500 known varieties of mangoes grown on the planet today!! ✨"Take a break from meals, watch how the body heals"✨Remember that the body has deep knowledge, nothing external will actually "heal you", they either help remove obstructions or create more of them. But ultimately it's always the body doing the work, in fact when we get out of the way, the body will show you the way. 🍊Honeybells/Tangelo/Minnoela - a citrus hybrid which originated in Florida around 1931. This variety is a combination of 'Bowen' grapefruit and 'Dancy' tangerine. This bell-shaped, sub-acid fruit is sweet with a strong tartness but wins on the juiciness and really does have a unique flavour all of its own. Excellent source of vitamin C and folate (B vitamin). High in potassium and fibre. Adding more fruit and removing the overt fried fats can really assist the bodies nature towards healing! ✨"In the midst of chaos, there is also opportunity." Sun Tzu✨Let go of past habits that no longer serve you and embody new ways of thinking - allow each chaotic moment to push you to a higher state of awareness ❤️. 🍀Ash Gourd: This winter melon originates in Asia and has been praised in Chinese literature for thousands of years for its medicinal properties. It has a mild flavour similar to a sweet cucumber. Helps keep stomach free of ulcers and intestinal parasites. Helps reduce excess body weight. Helps keep the body cool. Helps the body detoxify acid ash. Enhances memory faculties...it also contains an array of other super powers 👍. 🌼Gac fruit (aka 'The Baby Jackfruit') originates from Vietnam. This climbing vine can reach six meters long. The fruit is the size of a small melon, and changes from green to this wonderful dark orange colour. The thin layer of shell covers the light orange spongy flesh called the mesocarp, which can actually be eaten. Then the deep magenta-red, oily sacs of the inner core can be eaten raw or cooked, they are mild in flavour, more savoury than sweet, a mix between a cucumber and melon. This super food is usually harvested in Dec/Jan. ✨"Be here, be now, be still, allow, be "a rock with ears", be "a tree with loving arms", be "the all seeing eye that can not judge", become no-thing, be everything, be-cause you are the missing piece of the puzzle".⚡️Martha's Best (@marthasbest) Strawberry Papaya: Native to tropical America. These are a NON-GMO dwarf variety grown in Jamaica and Hawaii. 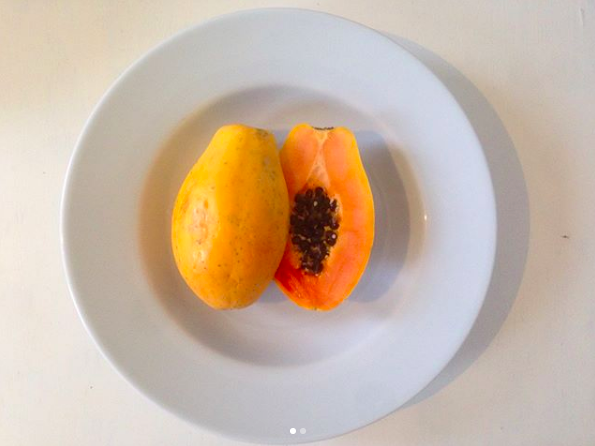 By far the sweetest, juiciest papayas I've ever eaten. Couldn't get enough at the Woodstock Fruit Fest in Hawaii 😋🌴. Another superfruit, rich in nutrients antioxidants, vitamins and enzymes that promote healing and regeneration in the body. Good for skin, digestion, eyes and heart health ❤️. ✨"What you get by achieving your goals is not as important as what you become by achieving your goals." Henry David Thoreau✨The journey is way more important than the destination...for it never ends and we never stop growing. 🍏Custard Apple / Cherimoya: Thought to be native to Ecuador, Colombia, Peru and Bolivia (where it still grows uncultivated) and then moved to Central America. Now grown all over the world, these beauties were grown in Spain. This, often heart shaped fruit has a sweet yet slightly tart flavour, a mix of banana and pineapple with hints of apple and pear all inside a white creamy flesh...it's like eating a pudding sorbet straight from the tree.⚡️Mark Twain called this fruit "the most delicious fruit known to men".👍⚡️Used in traditional Mexican medicine for its anxiety-relieving, anticonvulsant and tranquillising properties. The fruit has an ability to manufacture GABA (gamma-aminobutyric acid), a neurochemical known as "the euphoric amino acid" 😁. High in vitamin C, B vitamins and potassium. High in fibre, iron, niacin and contains powerful cytotoxins that are said to combat cancer, malaria and parasites whoop!!. ✨"Thought by itself has no power. It is only your belief in a thought that gives it life." Mooji✨🍊We always have a choice to lean on the positive side of thoughts. Reprogram your subconscious by creating new belief systems, affirm your new state of being, connect to your emotions and create a new reality 🍊👍.💚 Granadilla Passion fruit: Native to South America and grows in tropical and subtropical climates. The Amazon is home to more than two hundred species. This acid fruit has a pleasant floral aroma and delicious sweet yet tangy flavour. You can eat the crunchy seeds...in fact you can eat the fruit, leaves and flowers, they contain the alkaloid harman, which is a mild sedative and can aid in inducing sleep 😴. Rich in potassium-helps regulate heart rate and blood pressure. High in vitamin A and C-good for skin, eyes, tissue repair and immune system. Plus many more health benefits. ✨"No man ever steps in the same river twice, for it's not the same river and he's not the same man." Heraclitus✨Every 'thing' that we know changes, but do we know the 'thing' that is unchanging, the immaculate one that stays the same through all the ages? Know this and you will know the world. | Malaysian Jackfruit; This is the largest tree-born fruit on the planet, reaching up to 35kg for one fruit! Not only is it the largest it's also one of the tastiest 😁👍. The tree can produce about 100 to 200 fruits per year, I'd be happy with just one tree in my garden 😂. Jack is in the family of multiple fruits which means the body of the fruit is formed by clusters of flowers, the 'meat' are actually petals which would form into a flower 🌸. High in calcium, phosphorus, magnesium, potassium. There is a long list of benefits :). 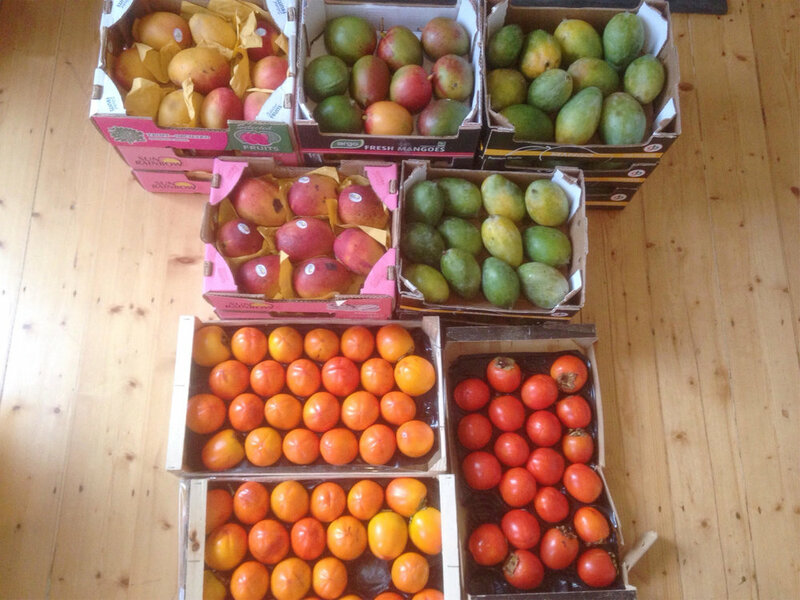 Friday fruit haul - 5 x Keitt Mango (Spain), 5 x Honey Dew (Brazil). Thanks to Southview Produce!! Today's fruit haul I found: 5 x Haden mango (Brazil), 3 x Kent mango (Brazil), 5 x Keit mango (Egypt), 3 x 'Bright red' Persimmon (Spain). I'm looking forward to making some mango smoothy bowls :). By eating our species specific diet we can slowly return to health and regenerate the body, mind and spirit. May all beings live in peace!! ✨"The greatest healing would be to wake up from what we are not." Mooji✨The highest knowledge is to know thy true self...'Osteen' Mango: originally from Florida a seedling of the wonderful 'Haden' variety. They are huge, mild yet sweet and always super juicy 😋. The Mango tree plays a sacred role in India; a symbol of love and some believe the tree can even grant wishes :) 🙏. 🍀Nutrition: •Potassium •Vitamin A, C, D and B-6. 🍀Benefits: •Lowers cholesterol •Improves digestion •Alkalizes the whole body. Today I decided to go for mangos all the way, they were tasting pretty good last week, mangos are great for hydration, and they help the body detox and regenerate. 5 x Keet (Egypt), 1 x unknown, 3 x Keit (Brazil), 2 x Kit (Egypt), 3 x Misk (Egypt). YUMMMMY!!! ✨"Love is the discovery that others are not others; beauty is the discovery that objects are not objects." Rupert Spira✨To know ones awareness is our intimate reality, only the mind distracts us from living and dwelling in it.🌻 Samani Egyptian dates: Originate from the Middle East and the Indus Vally, and have been cultivated in Egypt for thousands of years. Fossil records show that the date palm has existed for at least 50 million years!! Nutrition: •Potassium •Copper •Manganese •Magnesium •Vitamin B6. Health benefits: •Promotes digestion. •Anti-inflammatory. •Helps reduce blood pressure. •Reduced stroke risk.